Looking back on 2018, it’s clear that the year has been bookended by two significant moments for Australia’s waste and recycling industries. In January, we saw the fallout begin from China’s National Sword policy, an announcement which has since triggered a domino effect of similar policies around the world. Now, as the year draws to a close, so too does the consultation process for the proposed National Waste Policy. The process represents the first significant review of our national approach to a consistent and sustainable path for Australia’s recyclable waste for several years and is an exciting opportunity for the industry. Like the broader industry, 2018 has also been an incredible year of progress for the Australian Packaging Covenant Organisation (APCO) community. In April, Australia’s environment ministers announced the landmark 2025 recycling target and, in the process, endorsed APCO to lead the charge on creating Australia’s 100 per cent reusable and recyclable future for sustainable packaging. 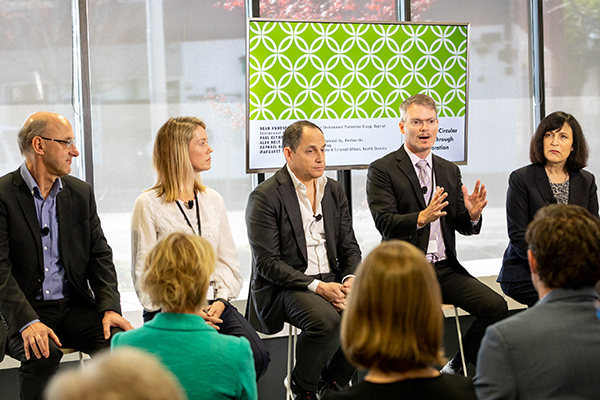 Then in September, we hosted an event at Pact Group headquarters in Melbourne to announce the second tranche of targets alongside the Hon Melissa Price, Minister for the Environment. It was fantastic to bring together so many key players from government and industry, and welcome leaders across packaging, retail, logistics, manufacturing, recycling and waste management. The 2025 targets have also driven many of the other activities conducted by the APCO team throughout the year. In June we launched the Towards 2025 discussion paper, providing members and industry with an overview of our proposed approach. The discussion paper was in turn supported by the Towards 2025 consultation process, workshops and question and answer sessions – all opportunities for industry to have an active voice in how we bring these targets to life. As a result of this process, we have now shared our draft strategic plan with government for consideration. We are excited to continue to constructively work with members to develop an appropriate way forward on the 2025 targets – and many thanks to everyone who has taken part in the consultation process to date. June saw the launch of our first brand audit in five years to ensure as many businesses as possible are meeting their sustainable packaging obligations. As a key APCO initiative, the brand audit will enable us to bring as many organisations as possible on the journey of reaching our 2025 target. Since starting the process, the APCO member base has grown by more than 60 per cent. The launch of the national packaging targets in September also coincided with the ministerial launch of the Australasian Recycling Label. A program we developed in partnership with Planet Ark and PREP Design, the labelling system was designed to help consumers better understand how to recycle packaging. I’m delighted to say that at the time of writing, the scheme had been adopted by more than 60 organisations, with 100 also using the PREP design tool. The year has also seen some incredibly exciting developments and progress from within the APCO member base. In August, we once again brought industry together for the annual APCO awards to recognise Australia’s sustainable packaging leaders. This year’s awards showcased achievements from a wide range of industries, with 13 sector categories, including manufacturing, retail, transport, technology, hospitality and pharmaceutical, and four excellence in packaging awards. The evening’s standout performer was Detmold Packaging, which took home the coveted Sustainable Packaging Excellence Award, commended for its collaboration with customers and researchers to work towards sustainable packaging. Other standout recipients included Campbell Arnott’s Australia (Outstanding Achievement in Packaging Design Award), which in 2017 implemented mandatory sustainability training for its internal packaging team, and the Australian Postal Organisation (winner of the Outstanding Achievement in Industry Leadership Award), which now has a 100 per cent recyclable packaging range, following the introduction of a take-back scheme and the adoption of the Australasian Recycling Label. Industry has also been quick to show its support for the 2025 targets. In April, Nestlé announced its ambition to make 100 per cent of its packaging recyclable or reusable by 2025, and in October joined forces with other businesses and governments in signing The New Plastics Economy Global Commitment at the Our Ocean Conference. Pact Group also announced its own 2025 targets, including plans to eliminate all non-recyclable packaging and offer 30 per cent recycled content across its packaging portfolio. Finally, members have also made exciting progress in the fields of research and development. This year Unilever announced the launch of its CreaSolv technology, a pilot plant for a radical recycling process that could address the billions of plastic sachets produced by a wide range of industries. In 2018, Unilever Australia and New Zealand also announced plans to introduce post-consumer recycled HDPE plastic for bottles of Australian-made home and personal care brands such as OMO, Dove, Surf, Sunsilk and TRESemmé. Dell has made big steps in breaking the cycle with plastic packaging by creating the world’s first commercial-scale, global ocean-bound plastics supply chain. The scheme includes processing plastics collected from beaches, waterways and coastal areas and using them within product packaging. The initial pilot project will start by keeping 7000 kilograms of plastics out of the ocean. Finally, Kathmandu continues to have great success with its line of Repreve clothing – where recycled bottles are collected, flaked, treated and turned into a workable, recycled polyester fibre. Between 2017 and 2018 alone, 6.9 million bottles were recycled into Repreve clothing. This is just a small snapshot of the remarkable work that’s being done both here and around the world in the fight to improve packaging sustainability. It’s also a clear indication that industry is stepping up to the mark when it comes to reducing packaging waste. There’s still a lot of work to be done, but here’s to another exciting year of progress and development from the APCO community.